This approach to Soda Peaks Lake begins off Forest Road #5401 which is a short distance from the Wind River Hwy #30. Also, this approach to Soda Peaks Lake is for those who are desperate for a heart attack... in other words this is a very challenging hike! 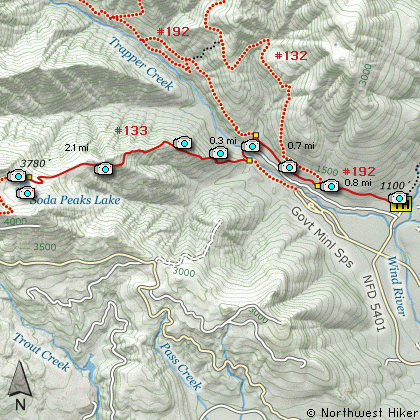 See Hike #58 for a more reasonable way to get to Soda Peaks Lake. Having said that, lets hike. The trail begins fairly level as it leaves the trail head. The trail parallels a private road that follows Trapper Creek for about 1.5 miles. At .8 miles you will come to the junction of Trail #132. Keep straight ahead and continue on until you reach the junction of Trail #133. Bear left and follow this trail. Trail #133 descends a bit to Trapper Creek and crosses on a vehicle bridge that has been transformed into a hikers bridge. After crossing the creek, the trail veers off to the left as it prepares to climb like a homesick angel up a very steep mountain. Just before lift off, you will pass a junction of a trail that leads back to the Government Mineral Springs. Now the climb begins. Thank goodness for the switchbacks. This trail climbs and climbs and climbs. Then it climbs some more. Then after that... you guessed it, it climbs even more. A couple enjoyable aspects to this approach to Soda Peaks Lake is that you get to hike/climb through a significant Old Growth Forest. I mean, these trees are really big and really old. Then there are also occasional views as you make your way up this mostly heavily timbered trail. When you finally do get to Soda Peaks Lake, if you have any energy left, walk down to the lake, then follow the user trail to the east side of the lake and up the rocky part of the East Soda Peak. Here you get some frosting for your hiking cake as your view out at Mt St Helens, Mt Rainier, and Mt Adams. The Wind River Highway, or FR30, makes a sharp right turn here and heads north. You, however, do not turn, but continue straight ahead on Forest Road 3065. After crossing the Wind River you will pass Forest Road 5401, but continue on straight ahead for another half mile or so. The road will narrow as you enter the Mineral Springs area. The trailhead for this hike is at the far west end of this road, just next to the mineral springs pump, where you can pump yourself a carbonated drink of mineral water if you have absolutely no taste buds left in your mouth.... hee hee hee.